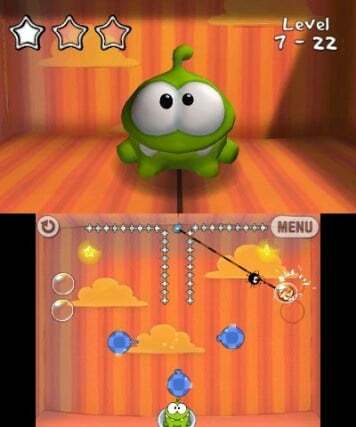 The Cut the Rope franchise may have risen to fame through its release on the Apple App Store, but it has also had a pretty prominent history on Nintendo’s most recent handheld systems, too. The first game in the series was originally ported to DSiWare back in 2011, before returning again on the 3DS eShop last year. However, sensing that this wasn't enough, developer Zeptolab has now enlisted the help of global publishing powerhouse Activision to distribute a physical retail version, Cut the Rope: Triple Treat. Is this the definitive version, designed to rope you in, or a cheap cash-in from which you should cut all ties? 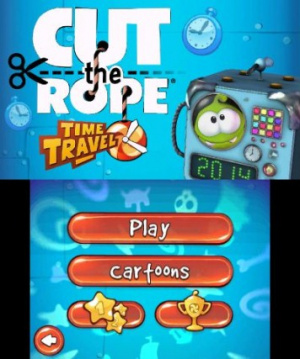 In case the rather obvious title didn't immediately give it away, Cut the Rope: Triple Treat is a compilation of three games from the super successful puzzle series: the original Cut the Rope, Cut the Rope: Experiments and Cut the Rope: Time Travel – not bad when you take into account that other Activision-published mobile ports such as Angry Birds Star Wars featured a lot less content and asked for a higher price. Across all three titles, the gameplay remains largely the same: cut ropes, pop bubbles and manipulate other objects in a certain way to transport a tasty piece of candy across a precarious obstacle course and into the mouth of an adorable, forever hungry creature known as Om Nom. Why you need to feed him is never made clear, but it’s nevertheless enough of a good reason to motivate you through each of the games. In keeping with the general idea behind nearly all puzzle games, getting that bonbon to where it's needed isn't always as straightforward as you might think. Each game starts off simple enough – to the extent that you can play them in pretty much any order you like – and you’re clearly introduced to a new gameplay mechanic the first time it appears. However, it doesn't take long for the challenge to ramp up, and this is where all games in the series to date have truly excelled — later puzzles require a solid understanding of the physics, as well as its many contraptions, if you don’t want Om Nom to go hungry. Cut the Rope’s success boils down to its impeccable level design. Objects are cleverly placed so as to provide both a passable and perfect solution. The latter involves you having to collect three gold stars mid candy transit, often forcing you to look beyond the most obvious A to B route. It’s the sort of gameplay concept that will very much appeal to completionists, and with three separate games to play through it’ll also take some time to achieve 100% completion. The difference between each of the included instalments is minimal, although the subtle changes do build upon the already impressive gameplay mechanics. In particular, Cut the Rope: Time Travel throws an extra Om Nom into the mix, meaning that you have to move multiple candies at the same time. Here, precision and timing are more key than ever, and as a result it’s worth leaving this one until after you've finished the others to maintain your interest through the hundreds of other stages available. To top it all off, there are online leaderboards and achievements for each game, features which will no doubt fan the competitive flames within some players and potentially keep them playing for longer. This is played entirely on the touch screen, meaning that the top screen is relegated to displaying a rather pointless 3D animation of Om Nom. It’s cute, and may prove endearing to younger players, but it otherwise serves as a poignant reminder that this title is merely a collection of ports and, therefore, hasn't been designed from the ground up to use the 3DS’s unique features. Otherwise, the controls are accurate and responsive for the most part, only sometimes proving fiddly when interacting with certain objects. In terms of content and value for money, Cut the Rope: Triple Treat does better than your average mobile port, offering over 650 stages across three games and for a reasonable price given that this is a physical release. Of course, it’s worth noting that all these titles are already available across many different mobile devices – and at a lower price, too. There isn't any exclusive content to set this game apart from the rest either, so you may want to avoid this if you already own any or all of these games on your phone or tablet. 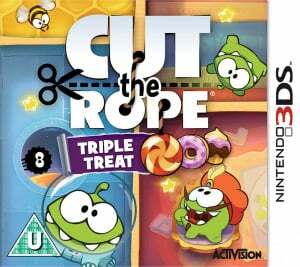 With three games’ worth of content all stuffed on to a single 3DS card, Cut the Rope: Triple Treat is certainly the best entry in the series that you can pick up for the system. Across each instalment, the level design remains tight and expertly crafted, and although the changes between games aren’t drastic, they are at least different and entertaining enough to hold your interest from start to finish. The inclusion of achievements and an online leaderboard system for each games further adds to this. If you already have easy access to these games via a smartphone or tablet then this retail release may not be worth your cash. 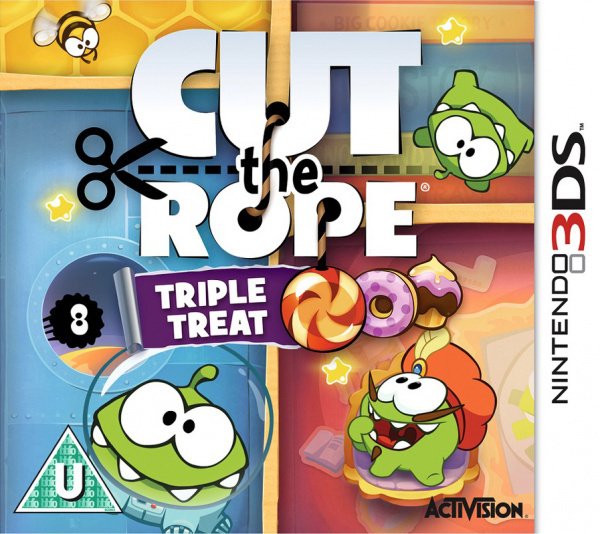 If you don’t, however, then Cut the Rope: Triple Treat’s asking price is reasonable enough compared to most physical releases to warrant a purchase. 50+ hours of gameplay says the trailer. I don't think so . These are the only games on my cell phone that I actually completed. I even paid for them, but I wouldn't double dip here. This game should be a DOWNLOAD only and not a 3DS card game its totally unnecessary seeing as they are even that big in size on other formats, its just been done that way to milk the extra $. @XyVoX: So what? I's rather have it on a physical cart. It's worth $20. I played this on my phone a lot, great game, I wish I could have had a pet that looked like om nom, he's so cute and that way I could feed him everyday. I... nope. Seems nice, but I'm not supporting straight mobile ports with such ridiculous pricing. Funny enough, Om Nom is currently all over McDonalds Happy Meals in germany! this is around £20 in the UK. Its too much for a game which can be got on mobile for lot cheaper. these mobile ports need to be £10 - £15 eshop releases max. Pushmo is better. Get that game my fellow Nintendo brothers. @KnightRider666 O so a game which plays just aswell but looks better (as its a higher resolution etc) on smartphones and is significantly cheaper £5 or under for all 3 is worth £20 for it being on a card, good luck with that logic. @XyVoX:The fact is I'd rather have something physical over a download. Did you forget that if you're system is lost or stolen you lose all your downloads? Or the fact that you can't sell a downloaded game you no longer want when you're done with it? Or the fact that if you're a collector like me, you get nothing for something you physically don't have? Good luck with your logic on that too buddy. Got this and love it! I like physical cartridges too. And considering how much content it has, it's well worth the $$. I've bought plenty more expensive DS and 3DS games with less content than this. @KnightRider666 Well some of us would rather have it digitally. Shame it's published by Activision, they're known for being unaware of the eShop. There's honestly no chance to see it on there. @CrabGats: I think every game should be available as a physical and a digital release. Gamers should be given a choice. We are the ones who keep these companies in business. @KnightRider666 Yeah, definitely, I'm not judging you for wanting it physical, it's just going to isolate some gamers from purchasing it, therefore losing potential sales. @CrabGats: I agree, but I don't feel it's a waste to be physical either. I tried Cut the Rope on my phone and I didn't get far before I gave up and deleted it. I am not much for puzzles unless they are Legend of Zelda or Kingdom Hearts type of puzzles. Both games play drastically different, so why would you even bring that up here in the comments? 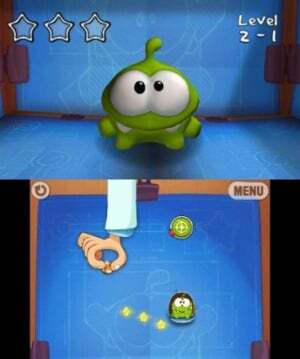 Plus, at least in my opinion Pushmo was pretty disappointing, while Cut the Rope is a perfectly fine, little puzzler. I got Rayman for (ca.) that price. @XyVoX I totally agree. And that goes for angry birds too. The levels ramp up in difficulty somewhat quickly, and there's a lot of them. If you want three stars on all of them, then 50 hours doesn't seem unreasonable. I think some of the solutions on the iPhone version required multi-touch. Are those puzzles replaced? It has all the smartphone vibe to it. I think I'll pass. I think it's nice it's a physical release. It's a really great game with lots of content. 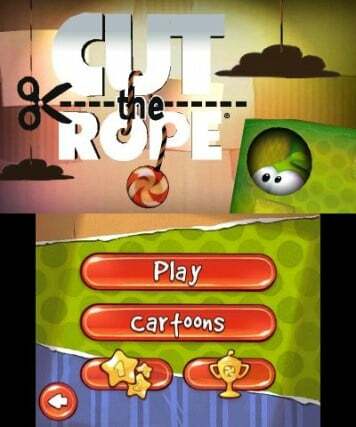 Unfortunately, I already got the 3DS eShop version of Cut the Rope, so I will skip this one, since it's more of the same. Well, it's € 30 ($ 40) here in Italy... Holy ____! I have Cut the rope on my tablet. It is a good game, but I don't see the point of getting it on a 3DS. I'll just pass. @XyVoX Its not even on eShop. @SecondServing Or get both Pushmo and the eShop version of Cut the Rope.